Thank you for viewing our 2019 Summer Camp Schedule. It’s great to plan summer activities well in advance and we’re happy to offer some fun and educational options this year. One of studio director Jim Josselyn's former students and pop sensation Charlie Puth wrote a number one song "See You Again" as featured in "Fast and Furious 7" and many, many other hits. Phoebe Ryan, another one of Jim's students recently opened up for Charlie in concert! Songwriting classes with Jim are available this summer - Call 732-219-1850 TODAY to register or come visit us at 10 Fairview Avenue in Little Silver - just call ahead to schedule a day and time to see us! Half hour and hour music lessons on all instruments are available throughout the summer from July 8th to August 29th. 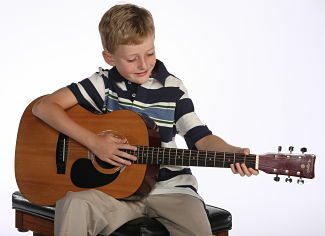 Private lessons are $260 for eight half hour lessons and 6 and 4 lesson plans are also available. Students 5 years old and up can take private lessons. Summer is a great time to sharpen or maintain your musical skills OR start a new instrument! Always wanted to try Piano? 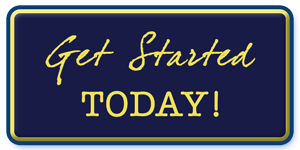 One week of four one hour lessons is a great start, and summer is the perfect time to try it out with one of our friendly, University trained teachers. The tuition is $175 and comes with a lesson and theory book. Students in Drama Fridays will learn the basics of acting - monologues, dialogues, scene study through fun theater games and improvs. Tuition is $220 for the summer! Love the show “Glee”? If you always wanted to be a part of a show and sing this is the camp for you. Tuition is $49. Learn to sing, act and move to routines from your favorite shows! A great way to build self-confidence and team work skills! Tuition is $49. If you have an idea or a suggestion for a camp please let us know. Summer is a great time to try something new not only for our students but for our staff! If you see a camp you like but the day/time/week we have scheduled doesn’t work for you, please call. We can run most of our camps with three or more students and we are happy to accommodate you if possible. 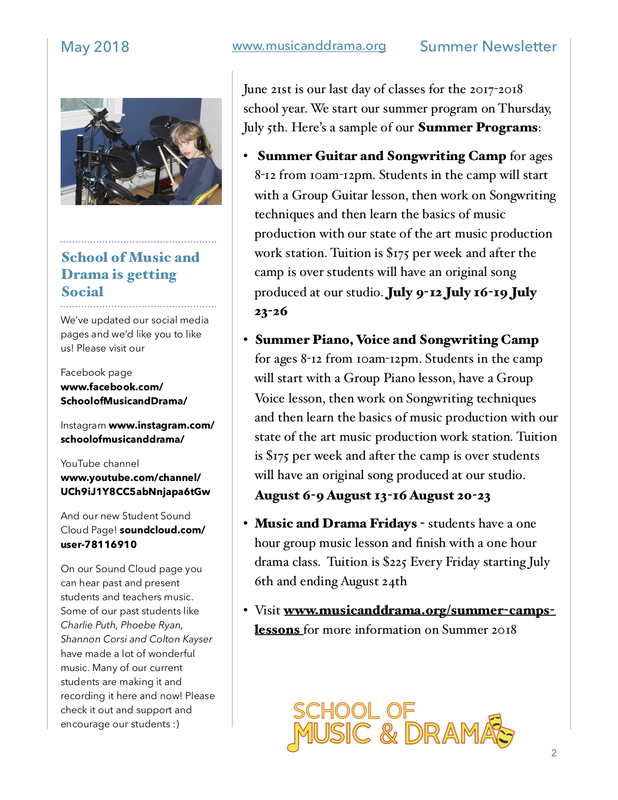 All Music and Drama camps and lessons are held at our Little Silver School. 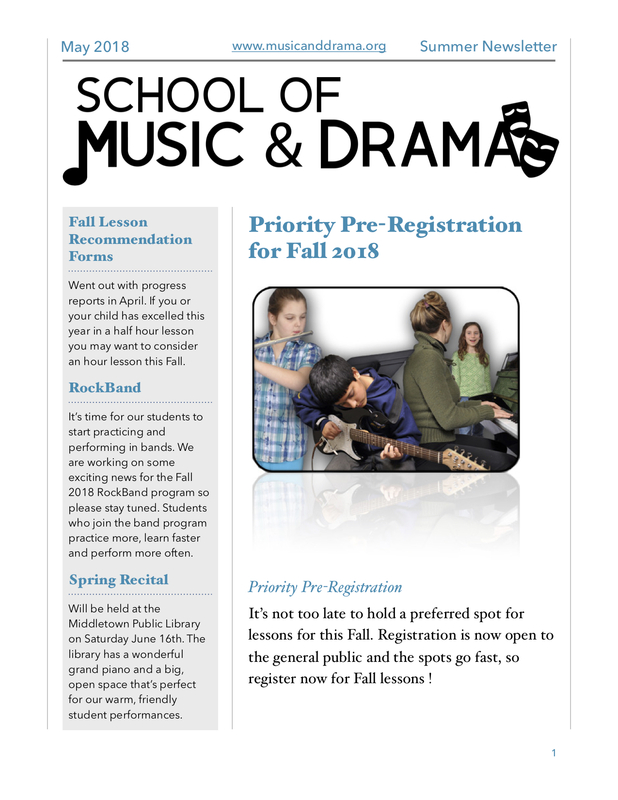 The School of Music and Drama was established in 2003 to bring excellence in arts education to Little Silver, Fair Haven, Rumson, Oceanport, Shrewsbury, Red Bank , Monmouth Beach and the surrounding areas of Monmouth County.